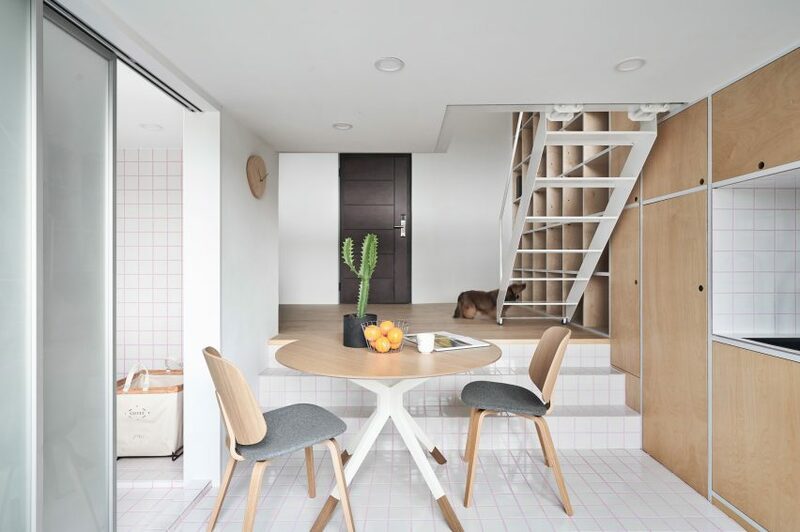 Located in a 12-floor residential tower in Taipei, the 33-square-metre apartment is a prototype for a tiny metropolitan guest house that can be leased to people working in the city. 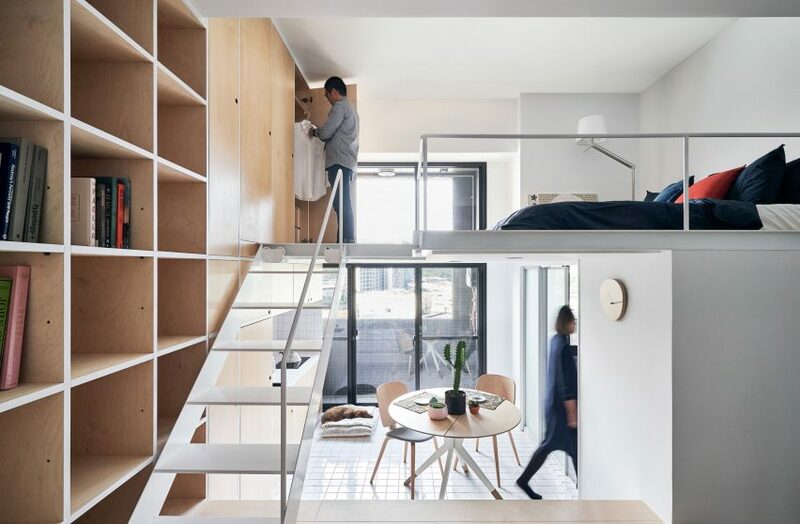 “Part of our clients’ focus is real-estate investment and they approached us hoping to showcase a model of smart urban living in a city with high average rent and limited land for developments,” Phoebe Sayswow Architects told Dezeen. Designed to be gender neutral, the XS House is spread over three levels in an open-plan space. 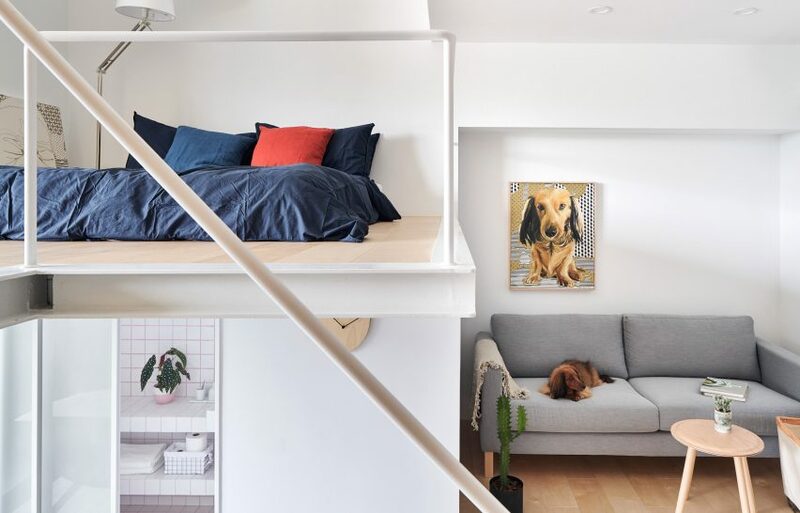 A double-height living room sits level with the entrance, a kitchen, dining room and bathroom are accessed down a set of two steps, and a bedroom is located on a mezzanine level above. “We decided to add the mezzanine to more effectively utilise the given space,” said the architects. 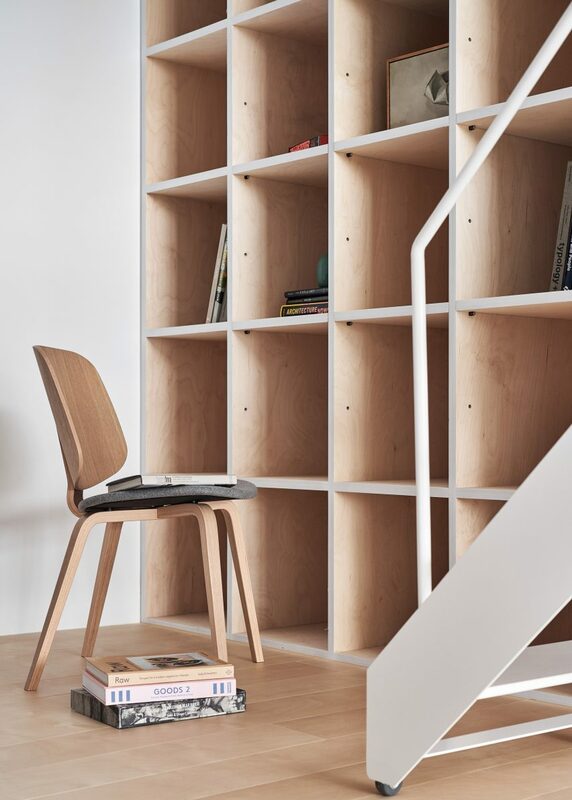 The white ladder that connects the living room to the mezzanine level is mounted on castors and can be moved to allow access to the built-in grid of birch shelves and cupboards that line one side of the apartment. 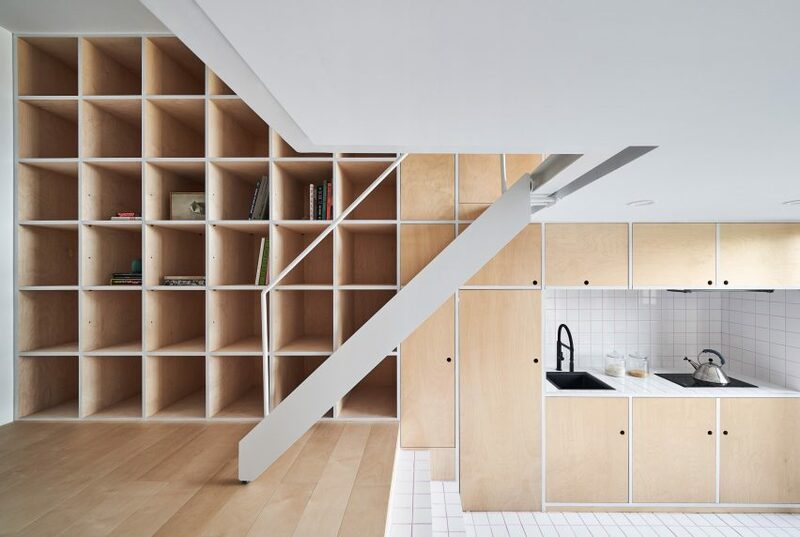 “We conceived a movable ladder and a step bench to connect different levels while giving a touch of playfulness and a sense of gathering to the house,” the studio continued. The living room space to the right of the entrance is simply furnished with a two-seat sofa and three-legged side table. Lined with white glazed tiles, the compact kitchen is built into the wall of birch storage opposite the bathroom. “Birch wood gives a sense of warmth that calms people, while the white glazed tiles are about pepping up spirits and rinsing one’s mind,” continued the architects. 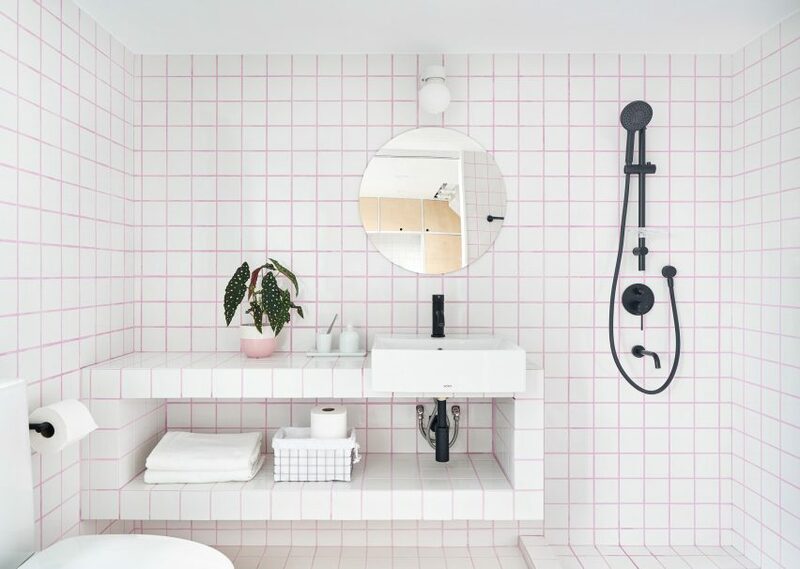 The tiles line the floor and walls of the bathroom creating a pink grid punctuated by white ceramics and black fittings. 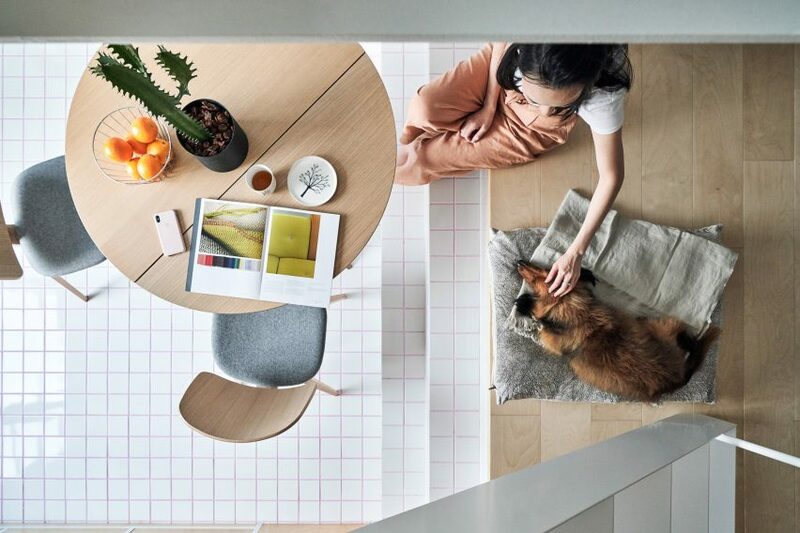 The steps that connect the living room and kitchen/dining room areas double as a place to sit at the circular dining table that is located between the kitchen and the sliding door to the bathroom. Floor to ceiling windows at the far end of the flat provide views out across the city from the kitchen space and from the bedroom on the mezzanine above while also letting light penetrate into the living room area. On the mezzanine level, a low level bed sits against one wall, while built-in birch wardrobes line the other. Also working with 33-square-metres, Manhattan studio JacobsChang designed a tiny blackened timber cabin on a shoestring budget for clients who built it in a forest in upstate New York with the help of their friends.